A statue, adorning a tomb, is seen at the cemetery of Bedzin, located in the vicinity of the city's coal fueled electricity plant. Coal is often referred to in Poland as it's "black gold", providing the country with energetic independence. However, coal has also revealed itself to be both a blessing and a heavy cross for Poles to carry: the European Environment Agency estimated in a 2015 report that air pollution, or smog, causes approximately 45,000 premature deaths per year in Poland. According to a report by the World Health organization 33 of the European Union’s 50 most polluted cities are located in Poland which relies on its prized coal industry for energetic independence while, at the same time, resisting moves to invest in renewable and cleaner sources of energy. Despite growing popular concern with air pollution, Bedzin still does not yet have its own air quality measurement station. It is believed that high levels of air pollution in Bedzin registered in a study carried out in 2016 are mainly caused by the burning of coal in home ovens for domestic heating. In an article about Poland's relationship with coal, its consequences on air quality, its stakes within the EU and on the sources of the problem of air pollution, Zachary Davies Boren explains that "cars and home furnaces produce the bulk of the country’s very visible PM10 pollution, but industry and energy are also significant contributors and even moreso of the toxic particulate PM2.5". On the issue of air pollution from power plants, it is estimated in a 2013 report that air pollution from coal fired power plants in Poland causes about "3,500 deaths per year, (...) 1,600 cases of chronic bronchitis, 1,000 hospital admissions and 800,000 lost working days attributed air pollution from coal burning for electricity". The Bedzin power plant is included in a list of the "108 Most Polluting Installations" of its kind in Europe. As for industrial caused air pollution on the European level, according to a report by the European Environment Agency (EEA) released mid 2017, "coal-fired power plants across Europe are responsible for the largest amounts of key pollutants released into the air". Adding to coal being considered to be intrinsically a non clean form of energy, to make matters worse for air quality in Poland, coal is often used in domestic heating furnaces across the country in ways that produce more smog and are also less efficient. As the platform My Guide Warsaw cautions in an editorial on the issue of air quality, "with the European Union putting great pressure on Poland to reduce its carbon emissions and its citizens also becoming more aware of the great problem of air pollution, it is a great issue that will continue to literally blacken the country’s image until cleaner forms of energy production are implemented". These concerns over Poland's international image became all too real at the end of 2016 with an article by the Financial Times where the Polish city of Skala made it to the news after it surpassed pollution record setter Beijing in the air pollution levels it recorded. Quoting the World Health Organisation report that places 33 out of Europe’s 50 most polluted cities in Poland, the article described Poland as "the continent’s capital of smog". Poland has been under increasing pressure by the EU to cut greenhouse gas emissions that contribute to global climate change and thus also under pressured to diversify its energy mix to include cleaner sources of energy in its portfolio and to scale down its reliance on coal. This, along with plunging world coal prices and increased coal production costs, has threatened the highly subsidized Polish industry along with scores of highly politicized and socially sensitive jobs: With its 100,000 coal dependent jobs, the powerful coal industry lobby has made sure the ruling national conservative Law and Justice party won the 2015 parliamentary elections on the promise of maintaining the coal industry as the main energy source for the country. When worried Polish residents lament that “winter is coming...” it is not the arrival of zombies that they fear, or even simply the cold weather itself. Instead, they prepare for some six months of smog caused by the mass burning of coal for domestic heating across the country. Some areas have been measured to be more polluted than Beijing and it is estimated 45,000 people in Poland die each year as a result. According to a report by the World Health Organization, 33 out of the most polluted 50 cities in the European Union are located in Poland. This has granted the country the title of ‘Europe’s Beijing’. In an article about Poland's relationship with coal, its consequences on air quality and on the sources of the problem of air pollution, Zachary Davies Boren explains that "cars and home furnaces produce the bulk of the country’s very visible PM10 pollution, but industry and energy are also significant contributors and even more so of the toxic particulate PM2.5". As for air pollution from coal fired power plants in Poland, it was estimated in a 2013 report that it causes about "3,500 deaths per year, (...) 1,600 cases of chronic bronchitis, 1,000 hospital admissions and 800,000 lost working days attributed air pollution from coal burning for electricity". It was also recently found in two studies in China that babies “had shorter telomeres—sections of DNA that act as caps on the ends of chromosomes—than babies born after the plant shut down”. The conclusion “adds to a massive body of evidence that closing down plants gives babies a greater chance at a healthy life. Shorter telomeres are linked with a host of health problems, including cancer, heart disease, brain decline, aging and premature death”. Adding to coal being considered to be intrinsically a non clean form of energy, to make matters worse for air quality in Poland, coal is often used in domestic heating furnaces across the country in ways that produce more smog and are also less efficient. While thirteen percent of the total of air pollution is estimated to come from vehicles,"50 percent of pollutants come from residential heating” caused by domestic burning of low quality coal, wood and even trash for heating by those who cannot afford adequate forms of fuel for the home stoves that at least a third of households still use, producing smoke filled with carcinogens like dioxins and benzo(a)pybinrene. It is considered that translucent or milkish smoke is the result of the correct use of domestic furnaces. Darker or colored plumes of smoke mean that either trash or other chemical filled fuel is being burnt. Many concerned residents have started reporting other residents to authorities whenever they see abnormal colors of smoke coming out of domestic chimneys. As the online platform My Guide Warsaw writes in an editorial, "some people argue the question is not just the burning of coal but how it is used. They argue that with modern filters, coal can be used as an effective fuel, which doesn’t harm people’s health. Energy power stations can be fitted with carbon capture and storage (CSS) to reduce carbon emissions. With the European Union putting great pressure on Poland to reduce its carbon emissions and its citizens also becoming more aware of the great problem of air pollution, it is a great issue that will continue to literally blacken the country’s image until cleaner forms of energy production are implemented". These concerns over Poland's international image became all too real at the end of 2016 with an article by the Financial Times where the Polish city of Skala made it to the news after it surpassed pollution record setter Beijing in the air pollution levels registered and describing Poland as "the continent’s capital of smog". Powerful coal industry lobbies influencing decision making and the mammoth number of jobs dependant on the coal industry have blurred the real scope of the problem for many in Poland, causing what activists and analysts describe as denial: sunny days shrouded in thick layers of smog are dismissed as simply foggy days by incredulous Poles who harbor ideological resistance to the idea that coal may be a health and environmental problem and believe there is much more politically at stake than their health or the environment. The reasons for this are rooted as deep as the mines that supply the fossil fuel. Coal is often referred to in Poland as it's "black gold" and the coal industry is a great source of national Polish pride and identity, spanning generations. In a country oftentimes occupied by its neighbours throughout its troubled history, coal has represented energetic self sufficiency and political sovereignty to the point that part of Polish national identity is rooted on coal mining. Many feel that if Poland would give coal up and would rely on gas imports from Russia’s pipeline taps, then the country would be economically and politically at Moscow’s mercy. Meanwhile to the West, old grievances persist and what many describe in Poland as “historical caution” advises Germany, and the EU along with it, not to be given too much leeway. At the same time, Poland has been under increasing pressure by the EU to cut greenhouse gas emissions that contribute to global climate change and thus also under pressured to diversify its energy mix to include cleaner sources of energy in its portfolio and to scale down its reliance on coal. This, along with plunging world coal prices and increased coal production costs, has threatened the highly subsidized Polish industry along with scores of highly politicized and socially sensitive jobs: With its 100,000 coal dependent jobs, the powerful coal industry lobby has made sure the ruling national conservative Law and Justice party won the 2015 parliamentary elections on the promise of maintaining the coal industry as the main energy source for the country. As a consequence of all this, the issue of air pollution and its solution through shifting away from coal to cleaner sources of energy, is often deemed as 'un-nationalist' by many and a 'non-issue' mostly brought up by 'leftists' and 'unpatriotic' elements of the society. The mining industry is considered with such respect and admiration that family tours to its mines and museums are popular and encouraged activities for older and younger generations and holidays are celebrated with parading uniformed miners. Mining work, a very dangerous and backbreaking activity, thus became a deeply prestigious profession due to its historic, cultural and political importance and until recently would guarantee a well paid and revered job for life. Wearing a filter mask has thus become an image that irks many: people who have turned up for work wearing masks used during their commute describe being mocked and very few, even amongst concerned citizens, have felt comfortable discussing the subject on the record for fear of social retribution and ridicule or to be deemed 'un-national' for questioning both the official and the political establishment’s position on the matter, let alone wear a filter mask. At the same time, wearing a filter mask has somewhat also evolved to a symbol of nonconformity and defiance to social pressure, to the government and the political establishment. Taking pictures of examples of air pollution on the public space has thus become an activity to be carried out with caution. This is not only because of the above, but also because of the authorities’ crackdown on low income households that illegally burn cheaper noxious materials for heating, such as trash, to save on the relatively more expensive coal. But many say this crackdown is not enough and only distracts from the root of the problem by scapegoating individual action rather than addressing its systemic root cause: coal as Poland’s main source of energy and the overwhelming use of obsolete coal fueled equipments for energy. For its part, when it comes to the Polish government, Health Minister Konstanty Radziwiłł attempted last year to shift the discussion surrounding air pollution to blaming health problems on people smoking. His declarations backfired as it lead the public to “calculate the effects of smog in terms of cigarettes”. 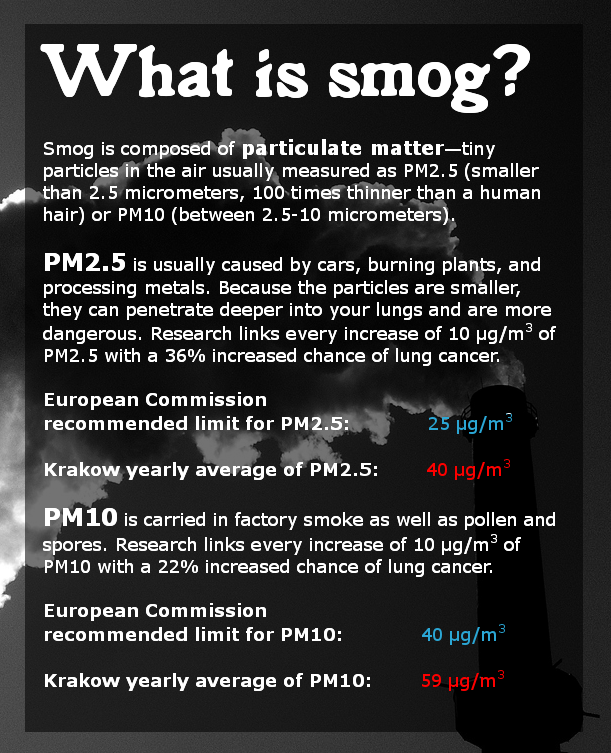 For example and according to anti-smog activist group 'Krakowski Alarm Smogowy', breathing Krakow's air in a daily basis is akin to smoking 2500 cigarettes a year, or roughly 7 cigarettes a day. Children are included in the estimate as air pollution does not discriminate according to age. Adding to this, critics point out that smoking is a personal choice while breathing polluted air is not. As for Europe as a whole,where other countries also still use coal, filthy air killed prematurely close to half a million people in Europe in 2014 and the tendency is to increasingly invest in other sources of energy. But a time when Poland is heading in the opposite direction and in a collision course with the EU on issues such as refugee quotas, its clampdown on the independence of its judiciary, its environmental and climate policies, and as it veers towards growing nationalism as well as a sharp drift to conservatism, Poland’s relationship with the fossil fuel has become a canary in the mine for the wider political climate in Poland. The photo essay ‘Dark Clouds’ examines the consequences of all of this on the lives and health of common Poles and an increasing number of concerned citizens as the country prepares to host the 2018 UN Climate Conference in Katowice, the Polish coal heartland, amidst what the conservative camp describes in Poland as a struggle for its sovereignty. This has made the air Poles breathe a symbolic political battleground. Furthermore, the essay approaches issues of environment, a topic not often covered in international media when it comes to extreme levels of pollution in Europe, being this type of issues more reported on in other areas of the globe. This is yet another reason why the more nationalist among the Polish constituency do not wish to address the issue or even consider that there is one to be addressed. But while an ideological battle is being fought on the political and public camp about smog and the coal industry, the consequences of air pollution are far from being theoretical for many Poles who believe their heath has been the first casualty of that battle. Eva Ciesielska, a 39 years old resident from Krakow has been battling with what she believes are air pollution related illnesses that have affected her family since they moved from Canada to Krakow which, according to air-pollution activist group Krakowski Alarm Smogowy (Krakow Smog Alarm), is one of the cities some of the poorest air quality in the world. Her husband and her two daughters have continuously suffered from severe respiratory difficulties and their routines are overwhelmingly conditioned by treatments and preventive measures to cope with air pollution. As studies suggest, including one on the impact of air pollution on children’s health in Krakow, continuous exposure to "air pollution can contribute to cardiovascular diseases and problems of the nervous system". It has also been linked to asthma, lung cancer, respiratory diseases, birth defects and premature death as well as the worsening of preexisting conditions such as allergies and immune system diseases.Air pollution has also been linked to delays in cognitive development in children. Health professionals have also likened a child playing outdoors in polluted areas in Poland to smoking cigarettes. In Krakow, for example, “benzo(a)pyrene can hit eight times the recommended maximum", according to the activist group Kraków Smog Alarm, which likens "each resident’s exposure to the toxin to what they would get from smoking 2,500 cigarettes a year”. Children are included in the estimate as air pollution does not discriminate according to age. As a result of skyrocketing levels of air pollution, some cities have shut down schools and kindergartens in days of higher levels of air pollution. However, some point out that those measures are too little too late: according to Piotr Siergiej, of anti-smog NGO Alarm Smogowy (Smog Alarm), authorities "only alert the public when air pollution exceeds the EU-wide norm by a whopping 600 percent". Meanwhile in the capital Warsaw and according to data quoted by online publication Quartz, in one day in peak winter, January 2017, "the levels of air pollutants registered in the city reached a whopping 437 micrograms per cubic meter. The 24-hour average norm established by the EU being 50 micrograms per cubic meter and in Paris officials declare a “smog alarm” at 80 micrograms per cubic meter". Wearing filter masks thus became one of the measures concerned residents deem necessary to deal with widespread dangerous levels of atmospheric pollution in Krakow and Ewa is no exception. Her two daughters always wear masks when outdoors. Other measures included buying air purifiers for domestic use and isolating gaps in doors and windows of older houses with thick fabrics to prevent polluted air from coming in. Because of all of this, it has become common for worried residents to describe a feeling of house arrest, made all too harder in rare sunny windless days in Winter, when smog is less dissipated and blown away from cities than in windier days. Anxious parents thus face a dilemma: to go out with their kids and enjoy rare sunny winter days or stay home and avoid breathing polluted air. Exhausted by the problem and worried about her daughter’s generation, Eva has taken upon herself to raise awareness to the problem through facebook campaigns and raised funds for the purchase of filter masks for orphaned children in Krakow who she worries about as they do not have parents like herself to do for them what she deems essential for her daughters. After numerous such campaigns, protests and pressure by concerned residents and groups, the municipality of Krakow started implementing measures to reduce the scope of the problem: subsidies have been approved for the replacement of old home furnaces for newer, more efficient and ecological ones. Residents who submitted applications by the end of 2017, will receive back up to 80 percent of the cost. In 2018, the subsidies will fall to 60 percent. The city authorities will also implement, from 2019, a total ban on coal burning. But with icy winters, coal fueled house heating is a life saving staple, especially for the elderly in Poland. Deemed cheaper, traditional furnaces are more common than other forms of heating like electric or gas amongst lower income households. However and even though coal may be a cheaper fuel for most, it is linked to the expenditure of billions of euros in healthcare in Poland caused by air pollution produced by the massive burning of coal for domestic heating in Winter. Apart from being linked asthma, lung cancer, cardiovascular problems, respiratory diseases and premature death, air pollution has also been linked to Alzheimer’s and dementia. The elderly, children, pregnant women and people with pre existing health problems are thus the most at risk groups when exposed to high levels of smog. In Krakow for example, hospitals have reported an increase of incoming patients in days when pollution levels are higher with symptoms and worsening illnesses such as violent coughs and nosebleeds, pneumonia, higher number of cases of heart attacks and strokes, and of those with respiratory problems such as chronic obstructive pulmonary disease and asthma. As quoted by The Guardian, Dr Krzysztof Czarnobilski, head of internal medicine and elder care at Kraków’s MSWiA Hospital: "The filthy air in Poland’s most picturesque city is making his elderly patients sick, shortening their lives and increasing their isolation. The pollution, he says, worsens cognitive and emotional problems such as dementia and depression, and exacerbates breathing and circulatory disorders". In days of higher smog readings, health workers advise the elderly to avoid exercise and to stay indoors, which can deteriorate both their health and disrupt essential social activities, worsening isolation and depression. However, coal retailers say the push to eliminate smog through toughening rules on furnaces "to make the most polluting types illegal and pay subsidies to help people buy more modern stoves, could have an unintended effect: It could leave some of the country’s poorest people without heat. They accuse anti-smog campaigners and the authorities of pushing unrealistic and costly standards for heating fuels and equipment that will increase energy poverty in Poland. When fuel becomes a disproportionate item in household budgets, people will burn trash or simply freeze if they can’t afford fuel”, said Łukasz Horbacz, the head of Polski Węgiel (Polish Coal), a lobby group of coal retailers. Many in the general public also oppose vehemently a change in the status quo. With an economic upsurge and historic low levels of unemployment, the mood in Poland has been generally very optimistic for what the future holds for the younger generations. However, the growing health concerns have also sparked fears that scaling down Poland's coal industry and diversifying its energy mix may spell economic disaster for the country. An example of that, the city of Bytom stands as a textbook illustration of the consequences of what the sudden and unplanned phasing out of the mining industry may bring and which many in Poland fear: some areas in Bytom, a traditionally coal town where mining has stopped, have delved into destitution and 13% unemployment that contrasts with other areas in the region such as, for example Katowice, the coal industry heartland, only 15 km away and with mere 2,5% unemployment. All of this, along with coal’s almost mythical status in Poland, has ensured the highly polluting fossil fuel remains as the country’s main energetic source despite growing concerns over air pollution and health problems. Such was the effort to eliminate competition to coal’s monopoly as the main source of energy that former Prime Minister Beata Szydlo of the ruling Law and Justice party and the daughter of a coal miner, “set tough regulations on the installation of wind turbines, in effect blocking competition from the renewables sector, which in 2014 covered about 10 percent of national energy needs”. Critics point out that “under the new legislation [...] wind farms would have to be built a minimum distance from residential areas of at least 10 times the size of the turbine – in effect a length of about 2 km. The constraint would exclude 99% of the Polish territory from wind energy development”. Meanwhile, residential areas sit mere meters away from industrial compounds and impatience is wearing thin as awareness to the dangers of pollution spread: Demonstrations against what protesters consider governmental inaction in face of high levels of smog in the country are an increasingly familiar scene in the Polish capital Warsaw and in other regions. On the opposite end of spectrum stand the more than 100,000 jobs dependent on the extraction of coal, representing one of the country's most powerful lobbies and the possibility of what many believe would be a loss of identity, economic independence and ultimately of political sovereignty. All of this makes it unlikely for Poland’s energy mix to be changed to more sustainable and cleaner sources any time soon. However, concerned residents, activists and critics warn that failure or refusal to address the growing grievances about the future for the younger generations both in terms of health, the environment but also of economy is neither neutral nor without consequences: in a country rapidly drifting into conservatism and away from the European Union consensus, this may mean yet another dilemma increasingly dividing the nation and steering it into isolation in the international stage. Zoe, a Polish 9 year old resident, writes on a notebook on her kitchen table where some of her drawings, depicting her impressions of air quality and smog in her home city of Krakow, are displayed. Some Polish cities have shut down schools and kindergartens in days of higher levels of air pollution. However, some point out that those measures are too little too late: according to Piotr Siergiej, of anti-smog NGO Alarm Smogowy, authorities "only alert the public when air pollution exceeds the EU-wide norm by a whopping 600 percent". Health professionals have likened a child playing outdoors in polluted areas in Poland to smoking cigarettes. In Krakow “benzo(a)pyrene can hit eight times the recommended maximum", according to the activist group Kraków Smog Alarm, which likens "each resident’s exposure to the toxin to what they would get from smoking 2,500 cigarettes a year”, or roughly 7 cigarettes a day. Children are included in the estimate as air pollution does not discriminate according to age. Apart from being linked asthma, lung cancer, cardiovascular problems, respiratory diseases, birth defects and premature death, air pollution has also been linked to delays in cognitive development in children. According to air-pollution activist group Krakowski Alarm Smogowy, or Krakow Smog Alarm, and as quoted by the city's newspaper The Krakow Post, the city has some of the poorest air quality in the world. "2014 figures from the World Health Organisation rank Krakow as 215/1624 cities globally that record annual mean concentrations of PM2.5 in their air. PM2.5 (particulate matter smaller than 2.5 microns, like toxic organic compounds and heavy metals) and PM10 (smaller than 10 microns, such as most factory smoke) are monitored because they have been shown to be a major cause of asthma, lung cancer, cardiovascular problems, respiratory diseases, birth defects and premature death. A 2013 study across nine European countries that for every increase of 10 μg/m3 in PM10, the lung cancer rate rose 22%—for every 10 μg/m3 increase in PM2.5, which can penetrate more deeply into the lungs, it rose rises by 36%". Eva Ciesielska (left), 39 years old, and her two daughters Zoe (center, 9 years old), and Lena (right, 6 years old), prepare to pose for a photo wearing their masks to demonstrate how the family looks like when they need to go outdoors or to open the windows in their home in Krakow, where air pollution has caused severe smog related illnesses to its residents such as asthma, circulatory and heart issues and worsened others such as allergies and immune system diseases. Apart from also being linked to respiratory diseases, birth defects and premature death, air pollution has also been linked to delays in cognitive development in children. Wearing filter masks are some of the measures concerned residents deem necessary to deal with widespread dangerous levels of atmospheric pollution in Krakow that have garnered its air quality the label of 'one of the worst in the world'. Other measures include buying air purifiers for domestic use and isolating gaps in doors and windows to prevent polluted air from coming in. It has become common for worried residents to describe a feeling of house arrest, made all too harder in rare sunny windless days in Winter, when smog is less dissipated and blown away from cities than in windier days. Some cities have shut down schools and kindergartens in days of higher levels of air pollution. In Krakow, one of the most affected cities in Poland, the municipality has started implementing measures to reduce the scope of the problem after numerous campaigns, protests and pressure by its residents. Subsidies have been approved the for replacement of old home furnaces for newer, more efficient and ecological ones. Residents who submitted applications by the end of 2017, will receive back up to 80 percent of the cost. In 2018, the subsidies will fall to 60 percent. The city authorities will also implement, from 2019, a total ban on coal burning. However because of the mammoth number of jobs involved in it, coal industry lobbies and the industry's traditional central role in Poland's energetic sovereignty, the issue of air pollution and potential move to reduce it through moving away from coal and into cleaner sources of energy is often deemed as 'un-nationalist' by many and a 'non-issue' mostly brought up by 'leftists' and 'unpatriotic' elements of the society. Because of the implications involved in moving away from coal, analysts have described a phenomenon of widespread denial of the environmental and health problem in Poland caused by an almost exclusive reliance on coal. Wearing a filter mask has thus become an image that irks many. People who have turned up for work wearing masks used during their commute have reported being mocked and very few, even amongst concerned citizens, have felt comfortable discussing the subject on the record for fear of social retribution and ridicule or to be deemed 'un-national' for questioning the conservative establishment’s position on the matter. A layer of smog caused by thousands of domestic chimneys of home heating furnaces that mostly run on coal (sometimes wood or trash in lower income households) is seen over the skyline in Katowice, Poland. It is estimated that "50 per cent of pollutants come from residential heating, with 13 percent from vehicles". While for many Poles the problem caused by smog is unequivocal, for others, who harbor ideological resistance to the idea that coal may be a health and environmental problem, say that images such as these show nothing but fog. But in clear, blue sky days of good weather such as the one pictured, the brown cloud covering the buildings over the city puts that into question. Because of the mammoth number of jobs involved in it, coal industry lobbies and the industry's traditional central role in Poland's energetic sovereignty, the issue of air pollution and potential move to reduce it through moving away from coal and into cleaner sources of energy is often deemed as 'un-nationalist' by many and a 'non-issue' mostly brought up by 'leftists' and 'unpatriotic' elements of the society. Because of the implications involved in moving away from coal, analysts have described a phenomenon of widespread denial of the environmental and health problems in Poland caused by an almost exclusive reliance on coal. A pedestrian wearing a filter mask passes by demonstrators protesting in the Polish capital Warsaw against what they consider governmental inaction in face of high levels of smog in the country, caused mainly by the burning of coal for domestic heating, a fossil fuel abundant in Poland, which the current government has promised to protect as the country's main source of energy. According to data quoted by Quartz in one day in peak winter, January last year, "the levels of air pollutants registered in the city reached a whopping 437 micrograms per cubic meter — the 24-hour average norm established by the EU being 50 micrograms per cubic meter. In Paris officials declare a “smog alarm” at 80 micrograms per cubic meter". City officials advised people to stay indoors if possible. Meanwhile, when it comes to carcinogenic benzo(a)pyrene and according data presented by the platform Poland Smog Alarm, inhabitants of Warsaw inhale it in amounts that correspond to smoking about 1000 cigarettes per year. The inhabitants of the suburbs of the capital inhale much more, between the equivalent to 1600 and 2400 cigarettes per year, including children as air pollution does not discriminate according to age. But, as reported by the NY Times also in the beginning of 2017 in peak winter in Warsaw, while the "average readings of fine particulates in the air exceeded Polish environmental norms by fourfold", at some points those levels can reach "1,000 percent of the norms". Apart from being linked asthma, lung cancer, cardiovascular problems, respiratory diseases, birth defects and premature death, air pollution has also been linked to delays in cognitive development in children. According to recent surveys it is also linked to Alzheimer’s and dementia. However because of the mammoth number of jobs involved in it, coal industry lobbies and the industry's traditional central role in Poland's energetic sovereignty, the issue of air pollution and potential move to tackle it by moving away from coal and into cleaner sources of energy, is often deemed as 'un-nationalist' by many and a 'non-issue' mostly brought up by 'leftists' and 'unpatriotic' elements of the society. Because of the implications involved in moving away from coal, analysts have described a phenomenon of widespread denial of the environmental and health problem in Poland caused by an almost exclusive reliance on coal. Wearing a filter mask has thus become an image that irks many. People who have turned up for work wearing filter masks used during their commute have reported being mocked and very few, even amongst concerned citizens, have felt comfortable discussing the subject on the record for fear of social retribution and ridicule or to be deemed 'un-national' for questioning the conservative position on the matter. A visitor is seen at the municipal cemetery of Bedzin, located in the vicinity of the coal fueled electricity plant that sits between the city and the cemetery. With wind blowing from East to West, from the electricity plant and into the cemetery, foul air over the city's cemetery is a reminder of the toll air pollution has taken on the Polish populations: the European Environment Agency estimated in a 2015 report that air pollution, or smog, causes approximately 45,000 premature deaths per year in Poland. According to a report by the World Health organization 33 of the European Union’s 50 most polluted cities are located in Poland. As the platform My Guide Warsaw writes in an editorial, "some people argue the question is not just the burning of coal but how it is used. They argue that with modern filters, coal can be used as an effective fuel, which doesn’t harm people’s health. Energy power stations can be fitted with carbon capture and storage (CSS) to reduce carbon emissions". The editorial continues warning that "with the European Union putting great pressure on Poland to reduce its carbon emissions and its citizens also becoming more aware of the great problem of air pollution, it is a great issue that will continue to literally blacken the country’s image until cleaner forms of energy production are implemented". These concerns over Poland's international image became all too real at the end of 2016 with an article by the Financial Times where the Polish city of Skala made it to the news after it surpassed pollution record setter Beijing in the air pollution levels it recorded. Quoting the World Health Organisation report that places 33 out of Europe’s 50 most polluted cities in Poland, the article described Poland as "the continent’s capital of smog". Eva Ciesielska (left), 39 years old, applies a nebuliser to her 9 year old daughter Zoe (center) in their apartment in downtown Krakow, Poland. Eva regularly administers medication through the nebuliser to her daughters during winter season when breathing problems have become omnipresent for all the family members caused by almost constant dangerous levels of smog in the city. As quoted by the city's newspaper The Krakow Post, according to air-pollution activist group Krakowski Alarm Smogowy, the city has some of the poorest air quality in the world. As studies suggest, including one on the impact of air pollution on children’s health in Krakow, continuous exposure to "air pollution can contribute to cardiovascular diseases and problems of the nervous system". Air pollution has also been linked to delays in cognitive development in children. As a result of skyrocketing levels of air pollution, some cities have shut down schools and kindergartens in days of higher levels of air pollution. However, some point out that those measures are too little too late: according to Piotr Siergiej, of anti-smog NGO Alarm Smogowy, authorities "only alert the public when air pollution exceeds the EU-wide norm by a whopping 600 percent". Health professionals have likened a child playing outdoors in polluted areas in Poland to smoking cigarettes. In Krakow, for example, “benzo(a)pyrene can hit eight times the recommended maximum", according to the activist group Kraków Smog Alarm, which likens "each resident’s exposure to the toxin to what they would get from smoking 2,500 cigarettes a year”. Children are included in the estimate as air pollution does not discriminate according to age. Patrick (right), a young muay thai Polish athlete, poses for a portrait with his friends while sporting a filter mask in downtown Katowice, Poland. Patrick says that beyond the benefits of filtering a part of the pollution in the air he breathes when outdoors in Katowice, he says he believes the mask also helps him build better lung capacity, necessary for his muay thai practice. Because of the mammoth number of jobs involved in it, coal industry lobbies and the industry's traditional central role in Poland's energetic sovereignty, the issue of air pollution and potential move to reduce it through moving away from coal and into cleaner sources of energy is often deemed as 'un-nationalist' by many and a 'non-issue' mostly brought up by 'leftists' and 'unpatriotic' elements of the society. Wearing a filter mask has thus become an image that irks many. At the same time, it has somewhat also evolved to a symbol of nonconformity. Very few, even amongst concerned citizens, have felt comfortable discussing the subject on the record for fear of social retribution or to be deemed 'un-national' for questioning the conservative position on the matter, let alone wear a filter mask. A family celebrates their granddaughter's ten year old birthday in Głuchołazy, Poland. With an economic upsurge and historic low levels of unemployment, the mood in Poland has been generally very optimistic for what the future holds for the younger generations. However, growing health concerns over low air quality caused by the massive burning of coal for domestic heating and energy purposes combined with the fear that a phasing out of the coal industry may cause an economic setback, pose what many in Poland see as a dilemma to be urgently solved for the country's future generations. Irek, a former miner (left), guides an educational tour to the Guido Deep Coal Mine located in Zabrze, in the south west Silesian region of Poland. The coal mining industry is a great source of national pride as well of identity, especially in the Silesian region, and tours to its mines and museums are popular and encouraged activities. Mining work, a very dangerous and backbreaking activity, is deemed to be a deeply prestigious profession due to its historic, cultural and political importance in Poland and until recently would guarantee a well paid job for life. However, plunging world coal prices as well as EU pressure to cut greenhouse gas emissions that contribute to global climate change and thus pressure to diversify Poland's energy mix to include more renewable and cleaner sources of energy, have threatened this highly subsidized Polish industry. But with its 100,000 coal dependent jobs, the powerful coal industry lobby has made sure the ruling national conservative Law and Justice party won the 2015 parliamentary elections on the promise of maintaining the coal industry as the main energy source for the country. A traditional domestic coal fueled furnace (left), a kind of stove which is present in almost every home in Poland, is lit on a cold winter evening. With icy winters, domestic heating is a life saving staple, especially for the elderly in Poland. Deemed cheaper, traditional furnaces are more common than other forms of heating, like electric or gas, amongst lower income households. However and even though coal may be a cheaper fuel for most, it is linked the expenditure of billions of euros in healthcare in Poland caused by air pollution produced by the massive burning of coal for domestic heating in Winter. A study by the European Environmental Agency estimates that air pollution kills about 44,000 Poles every year", Wojciech Kosc writes in Politico.eu. On the sources of the problem of air pollution Zachary Davies Boren explains in an article that "cars and home furnaces produce the bulk of the country’s very visible PM10 pollution, but industry and energy are also significant contributors and even moreso of the toxic particulate PM2.5". Coal retailers say the push to eliminate smog through toughening rules on furnaces "to make the most polluting types illegal and pay subsidies to help people buy more modern stoves, could have an unintended effect: It could leave some of the country’s poorest people without heat. They accuse anti-smog campaigners and the authorities of pushing unrealistic and costly standards for heating fuels and equipment that will increase energy poverty in Poland. When fuel becomes a disproportionate item in household budgets, people will burn trash or simply freeze if they can’t afford fuel”, said Łukasz Horbacz, the head of Polski Węgiel (Polish Coal), a lobby group of coal retailers. An image of St. Barbara, the patron Saint of miners and the coal industry, is seen at the Guido Deep Coal Mine located in Zabrze, in the south west Silesian region of Poland. On December 4th each year, festivities celebrate St. Barbara and Poland's miners and images of the patron Saint are a common sight across the Silesian region, the coal mining heartland. The coal mining industry is a great source of national pride and tours to its mines and museums are popular and encouraged activities. Mining work, a very dangerous and backbreaking activity, is deemed to be a deeply prestigious profession due to its historic, cultural and political importance in Poland and until recently would guarantee a well paid job for life. Two women stroll along an electric power plant pipeline in the forest in the outskirts of Bedzin, a city located in the Silesian highlands in Poland. A domestic chimney is seen spewing dark smoke in a winter afternoon in Głuchołazy, Poland. It is estimated that "50 per cent of pollutants come from residential heating, with 13 percent from vehicles". Most of the smog plaguing Poland is caused by domestic burning of low quality coal, wood and even trash for heating by those who cannot afford other forms of fuel for the home stoves that at least a third of households still use, producing smoke filled with carcinogens like dioxins and benzo(a)pyrene. It is considered that translucid or milkish smoke is the result of the correct use of domestic furnaces. Darker or colored plumes of smoke mean that either trash or other chemical fuel is being burnt and many concerned residents have started reporting to authorities whenever they see abnormal colors of smoke coming out of domestic chimneys. Adding to coal being considered to be intrinsically a non clean form of fossil fuel energy, to make matters worse for air quality in Poland, coal is often used in domestic heating furnaces across the country in ways that produce more smog and are also less efficient. As the platform My Guide Warsaw writes in an editorial, "some people argue the question is not just the burning of coal but how it is used. They argue that with modern filters, coal can be used as an effective fuel, which doesn’t harm people’s health. Energy power stations can be fitted with carbon capture and storage (CSS) to reduce carbon emissions". An elderly resident of Głuchołazy keeps herself warm with the help of her traditional domestic coal fueled furnace (left), a kind of stove which is still present in almost every home in Poland. With icy winters, house heating is a life saving staple, especially for the elderly in Poland. Deemed cheaper, traditional furnaces are more common than other forms of heating, like electric or gas, amongst lower income households. However and even though coal may be a cheaper fuel for most, it is linked the expenditure of billions of euros in healthcare in Poland caused by air pollution produced by the massive burning of coal for domestic heating in Winter. Apart from being linked asthma, lung cancer, cardiovascular problems, respiratory diseases, birth defects and premature death, air pollution has also been linked to delays in cognitive development in children. According to recent surveys it is also linked to Alzheimer’s and dementia. A study by the European Environmental Agency estimates that air pollution kills about 44,000 Poles every year", Wojciech Kosc writes in Politico.eu. Most of the smog plaguing Poland – it is estimated that "50 per cent of pollutants come from residential heating, with 13 percent from vehicles" – is caused by domestic burning of low quality coal, wood and even trash for heating by those who cannot afford other forms of fuel for the home stoves that at least a third of households still use, producing smoke filled with carcinogens like dioxins and benzo(a)pyrene. A resident carries a bag of coal scavenged from trains in the Bobrek area of the city of Bytom, Poland. With high unemployment rates caused by the closing of mines and mining related companies throughout Bytom, vulnerable residents in Bobrek resort to scavenging coal both for personal domestic use and to sell to other residents. Bytom stands as a textbook illustration of the consequences of what the sudden and unplanned phasing out of the mining industry may bring and which many in Poland fear: some areas in Bytom, a traditionally coal town where coal mining has stopped, have delved into destitution and unemployment — 13% in Bytom — that contrasts with other areas in the region such as, for example, Katowice, 15km away, with mere 2,5% unemployment. With the country going through an economic upsurge, many fear scaling down Poland's coal industry and diversifying its energy mix may spell economic disaster for the country. This, along with coal’s almost mythical status in Poland, has ensured the highly pollutant fossil fuel remains as the country’s main energetic source despite growing concerns over widespread air pollution and severe health problems. The European Environment Agency estimated in 2016 that bad air was responsible for almost 45,000 premature deaths a year in Poland. Poland has thus been under pressure by the EU to cut greenhouse gas emissions that contribute to global climate change and thus to diversify Poland's energy mix to include more renewable, cleaner sources of energy. This, along with plunging coal prices, have threatened this highly subsidized Polish industry. But with its 100,000 coal dependent jobs, the powerful coal industry lobby has made sure the ruling national conservative Law and Justice party won the 2015 parliamentary elections on the promise of maintaining the coal industry as the main energy source for the country. Plumes of smoke caused by domestic coal fueled heating stoves are seen over Katowice, Poland. It is estimated that "50 per cent of pollutants come from residential heating, with 13 percent from vehicles". More specifically, most of the smog plaguing Poland is caused by domestic burning of low quality coal, wood and even trash for heating by those who cannot afford other forms of fuel for the home stoves that at least a third of households still use, producing smoke filled with carcinogens like dioxins and benzo(a)pyrene. It is considered that translucent or milkyish smoke is the result of the correct use of domestic furnaces. Darker or colored plumes of smoke mean that either trash or other chemical filled materials is being burnt and many concerned residents have started reporting to authorities whenever they see abnormal colors of smoke coming out of domestic chimneys. Taking pictures of examples of air pollution in the public space has become an activity to be carried out with caution. This is because of the crackdown by authorities on households that illegally burn cheaper noxious materials for heating, such as trash, to save on the relatively more expensive coal. But critics say this is not enough and only distracts from the root cause of the problem by scapegoating individual action and low income households rather than addressing its systemic root cause: coal as Poland’s main source of energy and the overwhelming use of obsolete coal fuelled equipments for energy. A building in the Polish city of Katowice is covered in soot expelled from the thousands of domestic chimneys of home heating furnaces that mostly run on coal, sometimes wood or trash in lower income households, producing smoke filled with carcinogens like dioxins and benzo(a)pyrene. It is estimated that "50 per cent of pollutants come from residential heating, with 13 percent from vehicles". Footprints are seen on a puddle of coal mud in the depths of the Guido Deep Coal Mine located in Zabrze, in the south west Silesian region of Poland. Passersby walk on an overpass with a picturesque view to a coking plant in the Bobrek district of the city of Bytom, Poland. The plant is the last existent of the once important Huta Bobrek Steelworks. Bytom stands as a textbook illustration of the consequences of what the sudden and unplanned phasing out of the mining industry may bring and which many in Poland fear: some areas in Bytom, a traditionally coal town where coal mining has stopped, have delved into destitution and unemployment — 13% in Bytom — that contrasts with other areas in the region such as, for example, Katowice, 15km away, with mere 2,5% unemployment. With the country going through an economic upsurge, many fear scaling down Poland's coal industry and diversifying its energy mix may spell economic disaster for the country. This, along with coal’s almost mythical status in Poland, has ensured the highly pollutant fossil fuel remains as the country’s main energetic source despite growing concerns over air pollution and health problems. With unemployed parents, youth scavenge coal fallen from trains to take it home to heat their family homes in the Bobrek area of the city of Bytom, Poland. Irek, a former miner (right), guides an educational tour to the Guido Deep Coal Mine located in Zabrze, in the south west Silesian region of Poland. The coal mining industry is a great source of national pride as well of identity, especially in the Silesian region, and tours to its mines and museums are popular and encouraged activities. Mining work, a very dangerous and backbreaking activity, is deemed to be a deeply prestigious profession due to its historic, cultural and political importance in Poland and until recently would guarantee a well paid job for life. Piles of coal destined for domestic heating are seen at a sales point in the rail station area of Głuchołazy, a Polish town located in the Polish Czech border. Most of the smog plaguing Poland is caused by domestic burning of low quality coal, wood and even trash for heating by those who cannot afford other forms of fuel for the home stoves that at least a third of households still use, producing smoke filled with carcinogens like dioxins and benzo(a)pyrene. With the country going through an economic upsurge, many fear scaling down Poland's coal industry and diversifying its energy mix may spell economic disaster for the country. This, along with coal’s almost mythical status in Poland, has ensured the highly pollutant fossil fuel remains as the country’s main energetic source despite growing concerns over air pollution and health problems. A resident of the city of Bedzin walks in the vicinity of city’s power plant which runs on coal, Poland's so called "black goal" as it provides the country with energetic independence. "Cars and home furnaces produce the bulk of the country’s very visible PM10 pollution, but industry and energy are also significant contributors and even moreso of the toxic particulate PM2.5", Zachary Davies Boren writes. On the issue of air pollution from power plants, it is estimated in a 2013 report that air pollution from coal fired power plants in Poland causes about "3,500 deaths per year, (...) 1,600 cases of chronic bronchitis, 1,000 hospital admissions and 800,000 lost working days attributed air pollution from coal burning for electricity". The Bedzin power plant is included in a list of the "108 Most Polluting Installations" of its kind in Europe. As for industrial caused air pollution on the European level, according to a report by the European Environment Agency(EEA) released mid 2017, "coal-fired power plants across Europe are responsible for the largest amounts of key pollutants released into the air". As the platform My Guide Warsaw cautions in an editorial on the issue of air quality, "with the European Union putting great pressure on Poland to reduce its carbon emissions and its citizens also becoming more aware of the great problem of air pollution, it is a great issue that will continue to literally blacken the country’s image until cleaner forms of energy production are implemented". These concerns over Poland's international image became all too real at the end of 2016 with an article by the Financial Times where the Polish city of Skala made it to the news after it surpassed pollution record setter Beijing in the air pollution levels it recorded. Quoting the World Health Organisation report that places 33 out of Europe’s 50 most polluted cities in Poland, the article described Poland as "the continent’s capital of smog". An elderly Polish resident listens in a group gathered around protesters, demonstrating in Warsaw against what they consider governmental inaction in face of high levels of pollution in the country, caused mainly by the burning of coal, a fossil fuel abundant in Poland. The elderly, children, pregnant women and people with pre existing health problems are the most at risk groups when exposed to high levels of smog. Apart from being linked asthma, lung cancer, cardiovascular problems, respiratory diseases, birth defects and premature death, air pollution has also been linked to delays in cognitive development in children. According to recent surveys it is also linked to Alzheimer’s and dementia. The European Environment Agency estimated in 2016 that bad air was responsible for almost 45,000 premature deaths a year in Poland. Three hundred kilometres to the South, the problem of smog also persists: in Krakow for example, hospitals have reported an increase of incoming patients in days when pollution levels are higher with symptoms and worsening illnesses such as violent coughs and nosebleeds, pneumonia, higher number of cases of heart attacks and strokes, and of those with respiratory problems such as chronic obstructive pulmonary disease and asthma. As quoted by The Guardian, Dr Krzysztof Czarnobilski, head of internal medicine and elder care at Kraków’s MSWiA Hospital: "The filthy air in Poland’s most picturesque city is making his elderly patients sick, shortening their lives and increasing their isolation. The pollution, he says, worsens cognitive and emotional problems such as dementia and depression, and exacerbates breathing and circulatory disorders". In days of higher smog readings, health workers advise the elderly to avoid exercise and to stay indoors, which can deteriorate both their health and disrupt essential social activities, worsening isolation and depression. A cloud of brown smog approaches the highway between Katowice and Zywiec, the latter considered to be one of the most, if not the most, polluted city in Europe. While for many Poles the problem caused by smog is unequivocal, for others, who harbor ideological resistance to the idea that coal may be a health and environmental problem, images such as these show nothing but fog. But in days of clear, blue sky and good weather such as the one pictured, the brown cloud covering a part of the skyline puts that into question. Because of the implications involved in moving away from coal, analysts have described a phenomenon of widespread denial of the environmental and health problem in Poland caused by an almost exclusive reliance on coal. Emilia fixes the string of a malfunctioning shutter at her apartment decorated with air purifying plants in Bytom, Poland. As her pregnancy advances, Emilia has increasingly been staying indoors to avoid potential harm to her unborn child, especially in days when pollution is at higher levels as shown by mobile phone air pollution reporting apps. Polish authorities have warned that high smog levels can be especially hazardous for children, the elderly, pregnant women and people with health problems. It has been found that air pollution has been "strongly linked to heart, breathing and even cognitive ailments". Apart from being linked asthma, lung cancer, cardiovascular problems, respiratory diseases, birth defects and premature death, air pollution has also been linked to delays in cognitive development in children. It has become common for worried residents to describe a feeling of house arrest, made all too harder in rare sunny windless days in Winter, when smog is less dissipated from cities than in windier days. An elderly Polish resident takes a free spirometry respiratory test during a campaign set up by energy holding companies Tauron Ciepło and CEZ Chorzów in the central square of Chorzów, Poland. The test is a method used for diagnosing pulmonary obstructive disease and is part of a campaign of educational activities carried out by TAURON for the elimination of Low Stacks Emissions and to advertise what it describes as its environmentally friendlier heating solutions. The elderly, children, pregnant women and people with pre existing health problems are the most at risk groups when exposed to high levels of smog. Apart from being linked asthma, lung cancer, cardiovascular problems, respiratory diseases, birth defects and premature death, air pollution has also been linked to delays in cognitive development in children. According to recent surveys it is also linked to Alzheimer’s and dementia. In days of higher smog readings, health workers advise the elderly to avoid exercise and to stay indoors, which can deteriorate both their health and disrupt essential social activities, worsening isolation and depression. The European Environment Agency estimated in 2016 that bad air was also responsible for almost 45,000 premature deaths a year in Poland. As for Europe, as a whole filthy air killed prematurely close to half a million people in Europe in 2014. The report adds that “heart disease and stroke are the most common reasons for premature death attributable to air pollution, and are responsible for 80 percent of cases. (...) Air pollution also contributes to other respiratory diseases and cancer, and has non-lethal impacts on diabetes, Alzheimer’s disease, pregnancy and brain development in children". Young and elderly demonstrators protest in the Polish capital Warsaw against what they consider governmental inaction in face of high levels of smog in the country, caused mainly by the burning of coal for domestic heating, a fossil fuel abundant in Poland, which the current government has promised to protect as the country's main source of energy. With over 100,000 jobs dependent on the extraction of coal, the coal industry represents one of the country's most powerful lobbies and that has made it hard for the country’s energy sources to be changed to more sustainable and cleaner forms of fuel. Meanwhile, when it comes to carcinogenic benzo(a)pyrene and according data presented by the platform Poland Smog Alarm, inhabitants of Warsaw inhale it in amounts that correspond to smoking about 1000 cigarettes per year. The inhabitants of the suburbs of the city inhale much more, between 1600 and 2400 per year, including children as air pollution does not discriminate according to age. But, as reported by the NY Times also in the beginning of 2017 in peak winter in Warsaw, while the "average readings of fine particulates in the air exceeded Polish environmental norms by fourfold", at some points those levels can reach "1,000 percent of the norms". Apart from being linked asthma, lung cancer, cardiovascular problems, respiratory diseases, birth defects and premature death, air pollution has also been linked to delays in cognitive development in children. According to recent surveys it is also linked to Alzheimer’s and dementia. Plumes of smoke are seen over the city of Katowice, Poland. The Silesian city and Poland's coal mining heartland, will host the next UN Climate Conference in 2018. Poland has been under pressure by the EU to cut greenhouse gas emissions that contribute to global climate change and thus to diversify Poland's energy mix to include more renewable, cleaner sources of energy. This, along with plunging coal prices, have threatened this highly subsidized Polish industry. But with its 100,000 coal dependent jobs, the powerful coal industry lobby has made sure the ruling national conservative Law and Justice party won the 2015 parliamentary elections on the promise of maintaining the coal industry as the main energy source for the country. A passerby walks under an overpass in downtown Chorzów, Poland. It is estimated that "50 per cent of pollutants come from residential heating, with 13 percent from vehicles". Chorzów's economy used to be based mostly in heavy industry related to coal mining, to the energy sector, steelworks, chemistry and manufacturing. A high number of these businesses and companies were closed or scaled down over the last decades due of environmental concerns and lack of investment. As a result, unemployment stands at 6,6% and higher than, for example, its neighbor Katowice, 15km away, with mere 2,5% unemployment. While in other areas the closing or phasing out of industries has spelled disaster for the affected communities, Chorzów has been an example of a better outcome to the process. It is considered that the citymade a relatively successful transition from its reliance on industry to a service economy where a rate of unemployment of 12.6% in 2007 has been steadily declining until today and standing presently at 6,6%. Backed by a large outdoor sign drawing attention to pollution caused by the burning of coal for domestic heating in the background, residents and visitors enjoy a sunny day with some outdoors activities at the ice skating rink in downtown Katowice, Poland. However, looks can be deceiving as it is during sunnier days, with no wind to disperse air pollution, that higher levels of smog particles are registered in cities. Residents who are aware of the problem thus face a dilemma: to go out and enjoy rare sunny winter days or stay home and avoid breathing polluted air. It has become common for residents to describe a feeling of house arrest, made harder to endure in such rare sunny, windless Winter days, when smog is less likely to be blown away from cities than in stormy days. Demonstrators protest in the Polish capital Warsaw against what they consider governmental inaction in face of high levels of smog in the country, caused mainly by the burning of coal for domestic heating, a fossil fuel abundant in Poland, which the current government has promised to protect as the country's main source of energy. With over 100,000 jobs dependent on the extraction of coal, the coal industry represents one of the country's most powerful lobbies and that has made it hard for the energy economy to be changed to more sustainable and cleaner sources of fuel. Commuters are seen at the entrance to the subway in the vicinity of the Palace of Science and Culture (background) in downtown Warsaw, the most visible landmark in the Polish capital. According to data quoted by Quartz in one day in peak winter, January last year, the levels of air pollutants registered in the cityreached “a whopping 437 micrograms per cubic meter — the 24-hour average norm established by the EU being 50 micrograms per cubic meter. In Paris officials declare a “smog alarm” at 80 micrograms per cubic meter". City officials advised people to stay indoors if possible. But, as reported by the NY Times also in the beginning of 2017, in peak winter in Warsaw while the "average, readings of fine particulates [air pollution] in the air exceeded Polish environmental norms by fourfold", at some points those levels can reach "1,000 percent of the norms". Meanwhile, when it comes to carcinogenic benzo(a)pyrene and according data presented by the platform Poland Smog Alarm, inhabitants of Warsaw inhale it in amounts that correspond to smoking about 1000 cigarettes per year. The inhabitants of the suburbs of the capital inhale much more, between the equivalent to 1600 and 2400 cigarettes per year, including children as air pollution does not discriminate according to age. A mixture of haze and smog is seen over Warsaw in a February winter day. During winter, nearly all of Poland registers at one point or another, hazardous levels of air pollution, and specifically dangerous concentrations of mutagenic and carcinogenic benzo[a]pyrene: according to data presented by the platform Poland Smog Alarm, inhabitants of Warsaw inhale it in amounts that correspond to smoking about 1000 cigarettes per year. The inhabitants of the suburbs of the capital inhale much more, between the equivalent to 1600 and 2400 cigarettes per year, including children as air pollution does not discriminate according to age.